Replicating the grand design of the court of Versailles, this stunning piece is an artistic, grand-scale, architectural element. Fraught with exquisite detail from its breathtaking acantus leaf neck and waist to the stately egg and dart plinth, it is just as impressive displayed alone as filled with your lush greenery. 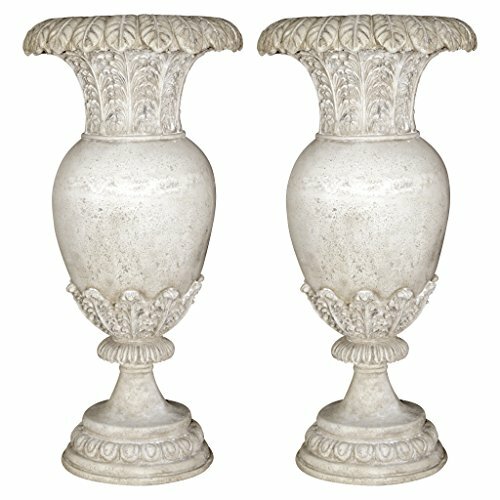 Cast in quality designer resin for display in home or garden, this over 2-foot-tall, Design Toscano-exclusive masterpiece boasts an exquisite faux stone finish. Imagine a pair flanking an entry or grand staircase! 12"dia.x25and 1/2"H. 14 lbs.